Any parent of a toddler-aged child knows that they are full of energy. They need somewhere to be able to work out all of that stored up energy. Being active is fun for your toddler and for you as the parent. Whether your little one is just pulling up, learning to walk, or running circles around you, climbing toys are beneficial for their development. Plus, they are so fun for toddlers and for parents as they see their children enjoy themselves and learning new skills. 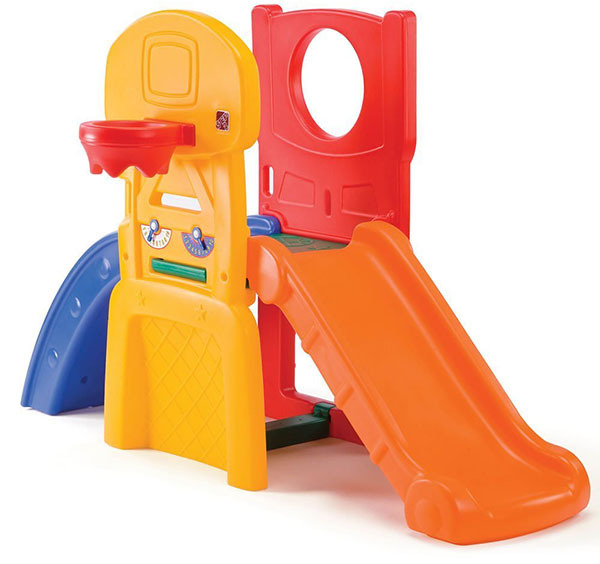 This climbing toy offers your child so many ways to play with a three-in-one sports activity center. It features a basketball hoop, a tethered baseball, and molded-in soccer goal. Included with the center are, a junior basketball and a plastic toddler baseball bat. 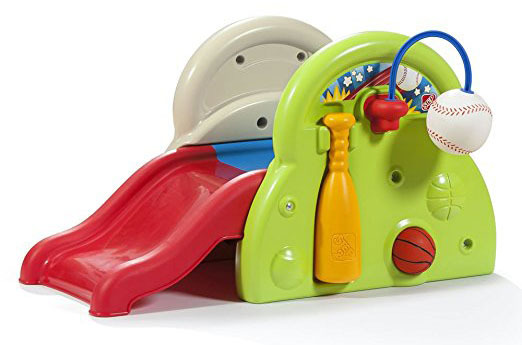 Your little one can grow in confidence and enjoy this as his first slide and grow even stronger as he learns to climb up the easy-up simple steps of the sports activity center. The junior stairs are made perfectly for your little ones as they learn to become a safe climber all the while enhancing their fine motor skills. For your older toddlers, the tethered baseball helps them develop their baseball swing but you will not have to chase the ball around the room. Even though this sports activity center offers much fun for your toddler, it also offers convenient storage so that all of the included sporting equipment is kept neatly in its own storage area on the outer wall. You will not need extra baskets or bins to keep the bat and ball near the activity center. Young toddlers could learn to pull up, stand, and balance on the side of this sports activity center. Your bigger toddler will not only become a little sports champion but will enhance gross motor skills by climbing up and down the child-sized stairs. Keep in mind that this climbing toy should be used only with parental supervision. Make note that some parents thought it was smaller than they had anticipated and may work better for smaller toddlers. It measures 27 x 29 x 15.5 inches and it weighs eight pounds. With three sporting activities to choose from, the fun never ends for your toddler-aged child. 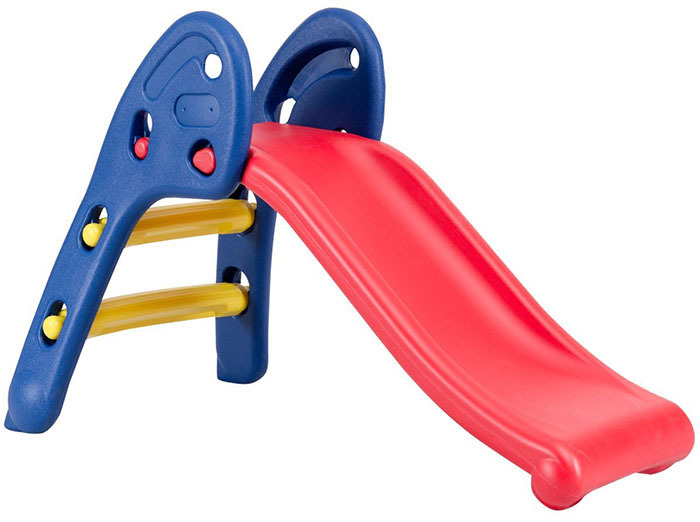 You will also appreciate that this climbing toy is on the lower end price wise compared to some of our other selections. The Woodland Climber is made for outside, active play for toddlers and young children in mind. 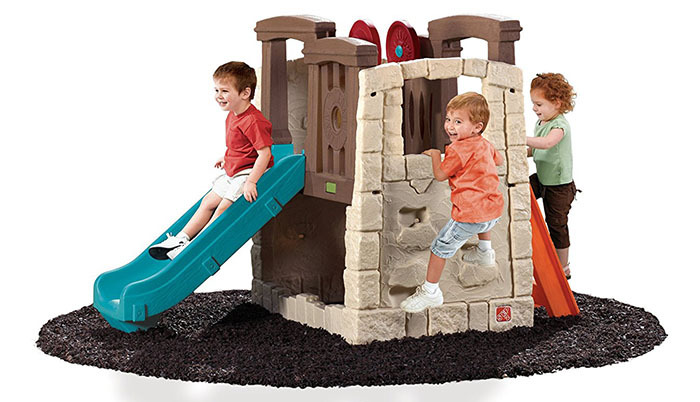 It is unique, durable, and includes a slide, two steering wheels, a platform play area, two rock wall-like climbing sides, and an optional area for a sandbox underneath. Your toddler will have so much fun climbing, playing, and sliding. Your children will love this climber center long past their toddler years. They will be encouraged to grow in gross motor skills and imaginative play. Parents may prefer this climber as it blends beautifully into residential surroundings because of its realistic textures and natural colors. The ladder is made with a realistic wood grain look. It is also nice that minimal adult assembly is needed. This activity center is made of wood and plastic. It weighs eighty-four pounds and measures 75 x 47 x 53.8 inches. This is a wonderful center for your little one but keep in mind that it runs at the higher end price wise when compared to our other top choices. This slide is perfect for younger toddlers and children as a beginner slide. It will promote their tactile sensing, help them practice their coordination as well as improve their ability to balance. This slide is bright, colorful, safe and durable. You will feel confident that your toddler will have loads of active fun but will also be secure. It is long lasting and will be a fun activity as your baby grows into a toddler and then a young child. Additionally, it is easy to install and is lightweight enough to use inside your home and then easily move it outside for some fun in the outdoors with your little one. The steps are designed as a simple, easy challenge and with your baby and toddler in mind with smooth edges that will not hurt their tender skin. It folds and collapses easily without any additional tools needed which is great for storage. This folding slide sits at the lower end of cost when compared to our other top choices and, in my opinion, is very reasonably priced. This jungle gym comes in a box full of adventure and fun for your older toddler and children. It is even sturdy enough for many adults. The climbing kit is wonderful whether you decide to use inside or outside of your home. You could make these activities part of the playroom, bedroom, playground, backyard, or basement. It would also be incredibly fun in a tree house. 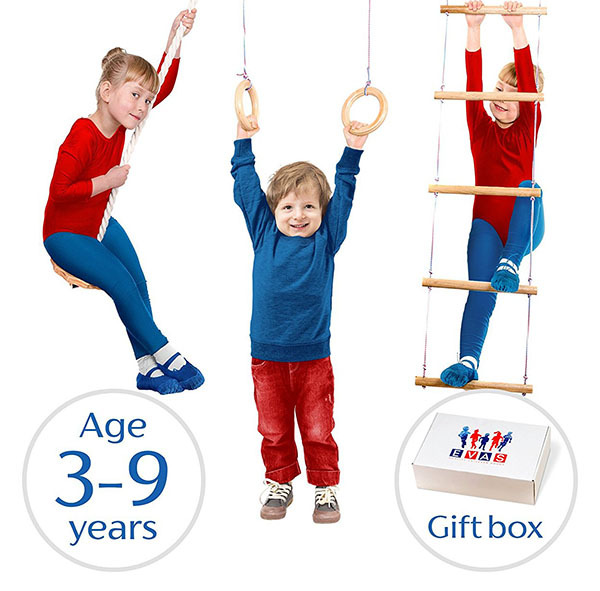 Included in the set are a wooden climbing ladder, gymnastic rings for junior kids and a rope with a wooden swing. You will also receive a hanging kit that includes everything you will need to install each of the features. The kit includes five carabiners, five anchors, one ring and one hanging strap for fastening to a tree. The ropes are made of cotton and are moisture resistant which makes them suitable for outside use. They are also soft and comfortable for your child’s hands as they play and swing. The swing is great for not only swinging but also climbing. Your child will have a blast climbing, swinging, and hanging while they are growing stronger. They will also likely grow in gross motor skills and decision-making skills. This climbing toy is great for toddlers around the age of three years old and up to nine years old. Parents have said that this set is wonderful for an outdoor playground or tree swing set. Your child will have a blast but also have the opportunity to grow stronger and advance in skills. The super fun playhouse is made for the outside but could possibly work in a very large playroom or basement area. 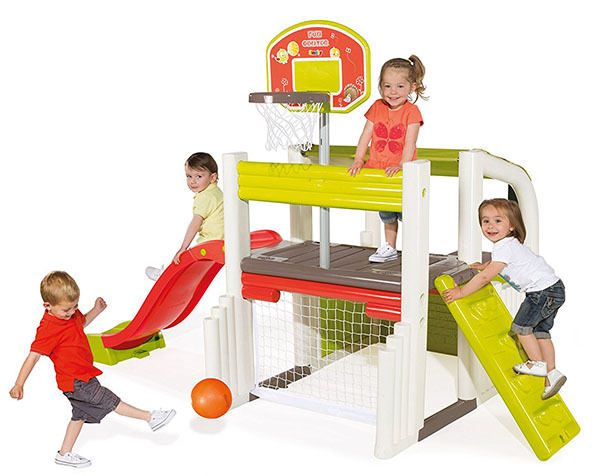 It gives your little athlete a place of total fun and activity. There is a basketball hoop, soccer net, and slide. There is even a place to take a little break and rest. I love the cute little picnic area on the side of the center. Your miniature soccer champion will have a blast kicking a ball into the net to score a goal. There is an endless play ahead with the reversible ladder and climbing wall on one side and the bowed slide on the other. Your toddler could go around and around doing each activity over and over. Your child will also enjoy tossing a ball into the basketball hoop. The center includes one ball. It is ideally designed for toddlers and children two years old and older and is suitable for a total weight of up to 110 pounds. It measures 9 1/4′ L x 6 1/2′ W x 5 3/4′ H and weighs sixty-one and three-forth pounds. Your child will learn to toss, climb, shoot, slide, and kick while having so much fun as they actively engage in this super fun climbing toy. It would work well in your yard or inside your home. The rock wall is an easy challenge that is safe and secure for your toddler to climb again, and again. As your child learns to keep score for different games, there is a place to record it under the basketball hoop in the built-in scorekeeper. This is a great way for your little one to learn numbers as they play. There are so many playtime possibilities for your little one. Included in this awesome climbing toy is an inflatable junior-sized basketball, soccer ball, and football. Your child will stay active and will enjoy tossing the football through the round opening, kicking the soccer ball through the bottom hole, and shooting the basketball through the hoop. Then, your child can enjoy the fun slide or small climbing wall. It is not recommended for children that exceed sixty pounds. It is durable and should be a fun activity for many years for your toddler. Parents recommend it for its durability, design, and ease of assembly. This climbing toy weighs around thirty-three pounds and measures 30 x 63 x 43 inches. It is priced in the middle range compared to some of our other top picks. 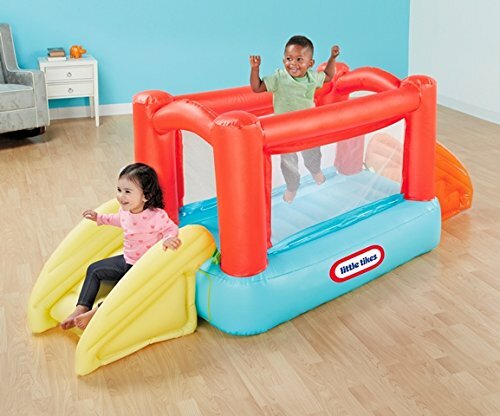 This indoor bouncer is such a blast for toddlers. It comes with a climbing ramp, slide, and enclosed bouncing area. It is built for two children to bounce and play together. It inflates simply and quickly with the built-in blower. A parent just needs to flip the switch. You can reverse the blower setting to easily deflate the bouncer to be stored. You can keep an eye on your little one bouncing away through the mesh netting. There are two inflated slides to add to the loads of fun your toddler can enjoy. This bouncer weighs ten pounds and measures 8 x 20 x 14 inches. You could also add these really fun and colorful balls to the bouncy area for even more active fun. These balls are perfect for your toddler’s hands and are sold separately. There are one hundred durable plastic balls in this set and a mesh bag for clean-up and storage. They could be used in kiddie pools, play tents, or ball pits as well as this bouncer. This climbing toy compares similarly price wise to the Step2 All Star Sports Climber. This awesome playset is ideal for toddlers. 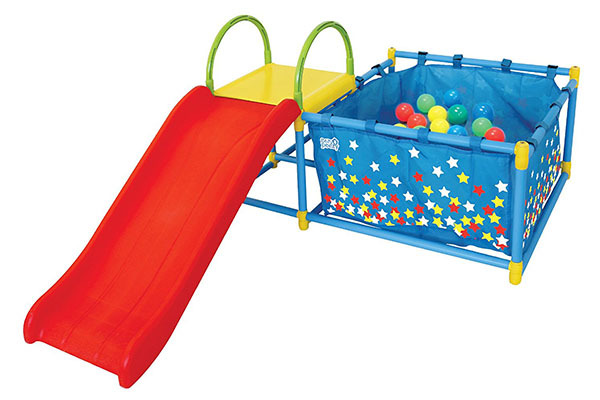 The safe ball pit alone is a perfect place for your little one to engage in active play. They can also learn to climb up and go down the fun, bright red slide. They can learn to throw the colorful balls into the ball pit as well. This is a truly wonderful three-in-one play gym designed with toddlers in mind. It will likely become your child’s favorite place to go at playtime. It is durable, safe, and sturdy and made of high-quality plastic. The assembly is very straightforward and easy for parents. It should take around five minutes to have it all together to start all the fun. It is lightweight which make this play gym portable from different places in your home. The idea for this gym is to give your children a safe place to play so they can grow, develop, and use their energy in a fun and engaging way. Children as young as one year can start in on the fun. Included in your purchase is the ball pit, the safe slide, the toss target, and fifty colorful balls designed for toddler-sized hands. It is made of sturdy, safe plastic construction which is very easy to sanitize and clean. It measures 56 x 62 x 29 inches and only weighs around twenty pounds. The maximum load is one hundred and fifty pounds. Be sure that your children are always supervised because of the balls that are included with this climbing toy. It is highly recommended for toddlers aged from one to three years old. This fun jungle gym is priced in the middle when compared to the others on our top choice list. Each of our top five climbing toys offers the opportunity for great fun, active play, and enhancement of gross motor skills for your toddler. They vary in pricing, activity and whether they are made for the indoors or outdoors but your toddler will be engaged as they learn, grow, develop, and play. Keep in mind that each of these toys, while designed with little ones in mind, requires adult or parental supervision at all times. I hope that you can find the perfect climbing toy for your toddler.